It’s no secret that I’m a huge ambassador for simplicity. When it comes to your website, less is more. People going to your website want to find what they are looking for and find it quickly. If I’m craving a big bowl of hot Pho, the traditional Vietnamese soup, I go to Pho Than Brothers. Why do I choose them? Because they sell ONE thing. Just Pho. And because their soup is PHOBULOUS. If you spend all your hours creating ONE thing, you have probably mastered it, right? That’s why, when I’m craving Pho, you betcha I’m going to head straight to the Pho masters. If you want to hire someone to implement a Facebook Ads strategy, are you more likely to hire the Facebook Marketing guru who offers Facebook marketing as their primary service, or the person who offers social media services for YouTube, Instagram, Pinterest and Facebook? If you want to hire someone to write the content for your website, are you more likely to hire someone who is a Web Content Writer, or the person that offers all kinds of writing services? This is about developing a niche expertise and making that very clear on your website, vs. being a "one stop shop". 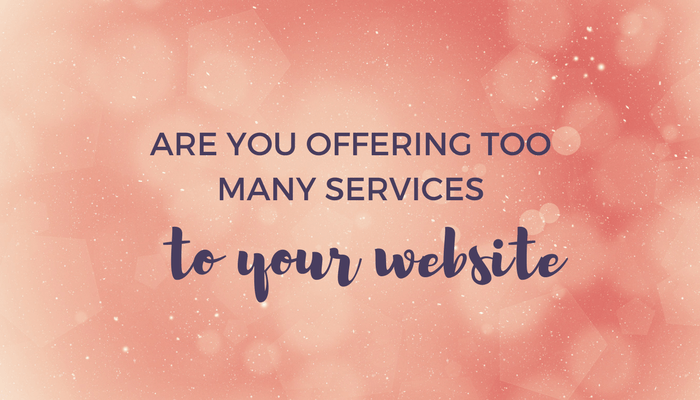 It's not offering EVERYTHING you know how to do on your website. It's about focusing on the one or two things you do the best, or are the most unique, and making that is your signature service or product. Having twenty services instead of two will not give you a better chance of attracting more clients. Instead it only creates confusion among prospects and might lead clients to think that you are OK at a lot of things, but excellent at nothing. It’s kinda like being in a crowded bar. When there are too many convertations going on, you can't really understand anything. The same is true of your website.